Home » Strength Training Equipment Guide » Our full Bodyblade Review: Does it work? Will you see results? 1 What is the Bodyblade? 2 How does the Bodyblade work? 3 Which muscles does the Bodyblade work? 5 Are there any downsides? 7 Which Body Blade is the best value for you? The Bodyblade reviewed here was designed by physical therapist Bruce Hymanson as an all-round functional training tool that helps stabilize the shoulder joint and the spine. It also works the arms and the core stability muscles. The Bodyblade is a shaped like a bow. It is between 3 and 5 foot long with a large rubber grip in the middle. It is made of carbon fiber so very light at just 1 – 3 pounds. It is sold as a kit which comes with an instructional DVD and wall chart. There are three types of Bodyblade – the CXT, the Classic, and the Pro. Click here to see latest Bodyblade prices on Amazon! The chart below will help you decide which version is best for you. How does the Bodyblade work? It is wobbly! The long ends of the blade flutter and vibrate when you hold the blade. They flutter even more when you shake it. More shaking = more resistance. This resistance produces rapid muscular contractions. In fact, the muscles can contract up to 270 times per minute! This is quite unlike any other type of physical training. By varying your stance and position, or the direction of the blade, you can work different muscle groups. Why should you buy a Bodyblade? The Bodyblade helps to tighten and tone up the arms and shoulders. Many users have reported that the skin on their arms does not ‘sag’ as much as it used to. As the back and core muscles need to tense to support the movement of the blade, there is also a light benefit to these muscles. The Bodyblade helps to STABILIZE the shoulder joint by working the smaller stabilizing muscles in and around the shoulder joint. Bodyblades have been used by physical therapists to help people who need to strengthen the rotator cuff muscles or who are recovering from shoulder surgery. It also appears to be useful to athletes who do repetitive throwing exercises. The Bodyblade can therefore be an excellent rehabilitation tool. There are no heavy weights to lift, so the Bodyblade is kind on the joints. The Bodyblade is also pretty good fun to use! It is a quirky exercise tool that looks pretty cool. Which muscles does the Bodyblade work? The main muscle groups that are used are the arms and shoulders. Holding the blade overhand tends to work the biceps. 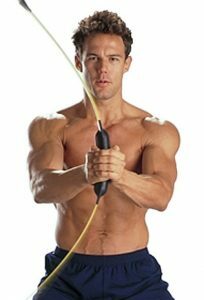 An underhand grip focuses on the triceps and forearms. If you follow the Super Six exercise workout that is demonstrated on the DVD, you will also work other muscle groups including the back, legs and abdominals. Most people use the Bodyblade for the Super Six exercises demonstrated on the video. This takes around 10 minutes and it is recommended that this is done several times a week for optimal benefits. By doing these exercises you can work the chest, abdominals, back, shoulders, arms and legs. Some people have reported sore wrists when using it. It is recommended to warm up the wrists before starting. The Bodyblade is a lightweight tool that helps tone up the arm and shoulder muscles and help with stabilization and muscle endurance. It therefore won’t help with weight loss as such, and due to the light weight and low impact, it is unlikely that your muscles will ‘bulk up’ using it. If you are interested in developing muscular strength and size, we would recommend you consider using traditional weights, such as dumbbells, barbells and resistance pulley machines. The Bodyblade has awesome reviews – typically 4-5 stars. It is an ideal tool for those looking for a lightweight resistance tool to help tone up the arms and shoulders and help stabilize the joints. It Bodyblade compliments all fitness and/or weight loss training programmes really well. Especially when paired with a Bosu ball, and a pair of our favorite HIIT trainers. See our independent reviews on bikes, treadmills and elliptical machines that can be used in your own home. Which Body Blade is the best value for you? The Bodyblade Pro Kit also retails on Amazon for $145.74. 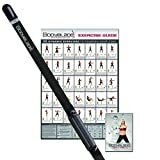 This kit includes the longest 5 foot version of the Bodyblade, a wall chart and an instructional DVD. The original and authentic Bodyblade created by physical therapist Bruce Hymanson. Smooth and variable resistive workout. Automatically adjusts to the fitness level of the user. Challenges every major muscle group. Lightweight and portable - travels anywhere. Weight: 2.6 lbs Length: 5 feet. An advanced performance training and conditioning tool; 10 minutes a day for a complete strength workout. Additional resistance for power training yet suitable for all adults. The Best Belling Bodyblade is the Classic Kit is now retailing on Amazon for $78.80. This includes a full 4 foot long Bodyblade, a wall chart and an instructional DVD. Lightweight and portable - travels anywhere. Weight: 1.5 lbs Length: 4 feet. A great all-around functional training and conditioning tool; 10 minutes a day for a complete strength workout. Enough resistance for performance training yet ideal for active aging and rehab of all adults. 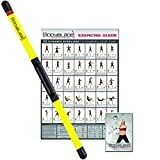 The Bodyblade CXT Kit costs around $66.59 on Amazon. This Bodyblade is a funky bright yellow color! 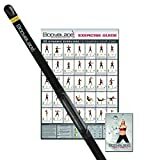 The kit includes the shortest version of the Bodyblade (40 inches), a wall chart and an instructional DVD which also includes a 30 minute cardio workout. Lightweight and portable - travels anywhere. Weight: 1.25 lbs Length: 40 inches. The CxT is great for beginners, seniors, group exercise classes, functional training, and rehab; 10 minutes a day for a complete workout.